We’ve talked in the past about the advantages that plastic has to offer your business, and it’s true – it’s a fantastically versatile material that sees widespread use in thousands of industries. A lot of these industries revolve around animals – such as homecare for pets or equestrian showjumping (something we have a bit of direct experience in ourselves.) So with that in mind, we decided this week to expound a bit on why plastic is so widely used for animal products. Of all the benefits that plastic rotomoulding offers, its safety is amongst the most important. Plastic is non-toxic and a poor home for germs and bacteria, which minimises the risk of animals getting infections from it. 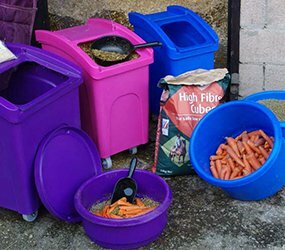 It’s fair to say that horses, cats and dogs don’t have a great concept of hygiene themselves – especially as the latter are sometimes known to eat unspeakable things – so having a material that neutralises those dangers straight from the off is always pretty handy. Animals are also notoriously messy eaters given their lack of opposable thumbs, so the fact that plastic is easy to clean is a much-lauded bonus. The material itself is odourless, which means that once your pet has finished feeding himself, he’s unlikely to take a bite out of the feeding bin or bowl to see what it tastes like. Incidentally, it also tastes pretty bland (er, we’ve been told), so those two factors together ensure that your animal only eats the stuff he’s supposed to, rather than the product holding it. An intrinsic toughness and durability are just two of the factors that make plastic such a fantastic material for treat toys. A well-made treat toy (such as those produced with our roto-moulding process) can withstand a lot of punishment from teeth and claws, easily for months and sometimes for years on end. They’re as resistant to the elements as they are to the animals, and they can be left outside in all weathers without the fear that they’ll degrade, rot or split when left to their own devices. Our showjumping equipment is perfect for equestrian use. It’s light, which means that if the horse doesn’t quite make the jump there’s an absolutely minimal chance of injury – and it’s tough, which means the products themselves can withstand a lot of these sorts of impacts, too. Mounting blocks are also easy for you to lift and move wherever you need to – handy if you have a restless horse who won’t stay still for long. What’s more, this same lightweight nature means that it’s easy to transport along with your animals. And finally, undoubtedly the greatest advantage that our plastic products have to offer is their versatility. Our roto moulding process means that we can manufacture any product in any shape or size you require – whether you’ve got a canine, a feline, an equestrian mammal or an extremely large fish (we always try and keep an open mind here at Excelsior). If you’re interested in other benefits plastic has to offer, don’t hesitate to read our blog on uses for material handling bins.